The Pacuare River is one of the best choices for your adventure treks in Costa Rica. No other trip in the country exists that offers you a perfect blend of wilderness exposure and excitement, all in one day. Pacuare is world famous for its sheer beauty. A true river gorge, it is flanked by steep, green walls. Here you enjoy the feeling of total isolation from urban life and the realness of being connected with nature. You see waterfalls cascade into the river from both sides as colorful, tropical birds fly right over your head. Amazing views of this virgin tropical rainforestarea, appear before your eyes as you descend this true exploratory land. Wildlife is abundant, with sloth, toucans, parrots, coatis, morpho butterflies and colorful frogs being common sights. Upon arrival to the river we will gear you up with a life jacket, helmet and paddle and then briefyou with a full safety orientation talk. Finally, it is time to take off down the rapids! The first 4 miles consist of fun class II-III rapids which is a perfect time to test your new river skills and gain confidence in your team. Here you can find pockets of secondary growth forest that is extremely beautiful. 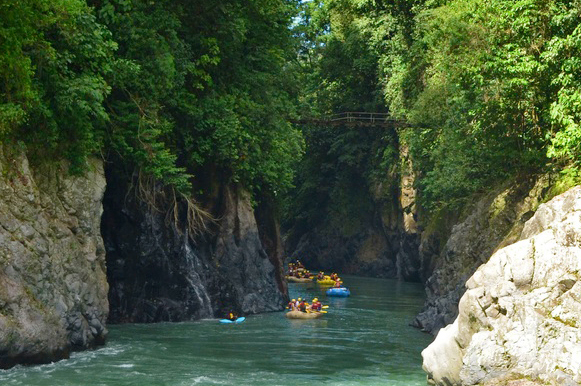 After about 40 minutes we will enter the famous Pacuare River Gorge, which is 5 miles of some of the best white water Costa Rica has to offer. The rapids here are "Terciopelo snake", "Double drop", "Upper and Lower Huacas", "Pin ball" toname a few. You will also see the Huacas watefall, a 150 foot dramatic drop into the river. After the gorge the rivers opens up to a 5 mile stretch on the Valle del Pacuare, where the river has a different character. It is wide open, which gives you the opportunity to rest a bit and take the opportunity to do some wildlife spotting. The main rapids here are "Cimarrones", "The Play Hole", "El Indio" and "Magnetic Rock". The forest remains just as lush, and the rapids just as fun. What to Bring: Sunblock, Water, towels, comfrotable shoes that can get wet, a bit of cash and sunscreen.